Must follow the Advertising Policies and Procedures when considering advertisements for the newsletter. Must develop 3 newsletters a year that will be distributed to all active/current members and any states that request them. Must participate in NASP online discussions through the state newsletter editors’ listserv operated through NASP. Receive submissions for the newsletter and other correspondence. Assist in maintaining the member list on the website. Update the membership application form as needed. Process membership applications per designated procedures. Assist members with any membership questions or concerns. Facilitate communication with members and the public through the website, listservs and real-time technology. Develop/maintain a communication plan that includes a state of the art website, listservs, video conferencing and real-time communication technologies. Consult with the president in the contracting with a webmaster. Consult with conference committee to ensure that appropriate technology is available for speakers at the conference (i.e., wireless internet connections, etc.). Develop a plan to increase the media equipment owned by CSSP (i.e., LCD projector) and develop a plan for maintenance of equipment. Responsible for representing and promoting the Society’s professional interests to members, other professional organizations, educators, and to the public at large. Work with conference committee chair to conduct nominations and arrangements for presentation of School Psychologist of the Year. Coordinate information distribution with the newsletter editor. Coordinate release of information and activities with the President. Represent and promote CSSP’s professional interests to members, other professional organizations, educators, and the public at large. Create a written document outlining qualifications for awards candidates and nomination procedures. Provide above document to the Publications Chairperson for dissemination in all appropriate newsletters. 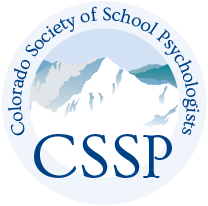 Work with NASP Chairperson to establish nominations deadlines and award presentations for the Colorado School Psychologist of the Year and other awards presented by CSSP. Develop press releases for the above mentioned activities. Prepare information and materials to be distributed at the fall conference. Create a list of organizations with email contact information that would assist in promoting the field of school psychology if provided information about the field, its activities, etc.